Hello, my name is Rachel Fischer and I am a senior in my last undergraduate semester at Willamette University where I am pursing a dual major in Environmental Sciences and Anthropology. I was born and raised in Anchorage, Alaska. I grew up playing under the midnight sun during the summer and watching the Aurora Borealis come and go during the winter. Being one of four kids, my family was very active. From a young age, my siblings and I participated in sports and spent our weekends hiking, biking, skiing, and sledding. Soccer particularly captivated my family, so I grew up playing on competitive soccer teams and watching my siblings do the same. I pursued soccer throughout my time at Willamette University, playing for the varsity team and spending three of my four years as a captain. I became involved with Straub last fall in preparation for my senior Anthropology thesis and will become increasingly involved with their work through my thesis research and with summer camps in the coming seasons. I grew up climbing mountains, excited to reach the top and look down at what I had accomplished but every time I would summit one mountain, I would look out across the Chugach mountains and find five new mountains I wanted to climb. I remember planning my next hike before even reaching the car, feeling like I was never quite done exploring. Growing up in Alaska has certainly shaped the interests and values I hold today, inspiring in me a love for the outdoors and leading me to major in environmental sciences. Alaska has humbled me into recognizing the forces of nature and the dangers of trying to manipulate the natural world to our convenience. I feel as though the pace of Alaskan life, though it might feel slow at times, has taught me a sense of patience, independence, resourcefulness, and curiosity. Since moving to Salem in 2015, I have come to appreciate the stunning coastlines and beauty in native tree, plant, and animal species that Oregon offers. The changing seasons of summer to fall in the Willamette Valley amaze me, lasting longer than Alaskan falls and bringing about the most beautiful color palettes. In general, Alaska feels different in that it is home to more genuine wilderness than anywhere else I’ve been. Alaskan coastlines are certainly rockier, colder, and harsher and our mountains a bit bigger and more frequent, but I certainly love both states for the unique landscapes and endless adventure they offer. Some of my fondest memories from home come from camping almost every weekend during the summer. One weekend that particularly stands out was during my first summer home from college. My sisters and I embarked on a quick back packing trip to cover the first leg of the Crow Pass Trail, a segment of the longer Iditarod National Historic Trail. Our hike up the Chugach National Forest covered 3-4 miles of uphill, and at times seemingly vertical, terrain to where we set up camp next to a stunningly blue glacial lake. On our ascent we came across Dall sheep and more marmots than I could count. Although the weather was almost hot on the way up, when we summited Crow Pass and dipped down into Raven Creek Valley we found snow, and lots of it. This trip remains with me as a reminder of my love for Alaskan terrain, and the bizarre conditions and endless adventure you might find. Whether it’s going for a bike ride at 10pm with the sun still high in the sky, or spontaneously finding snow in the heart of summer, Alaska and its landscapes will always hold a special place in my heart. 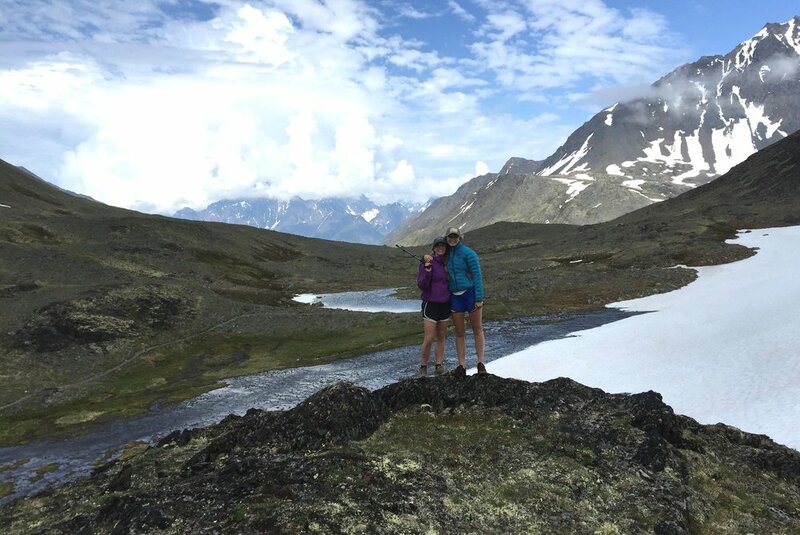 Rachel grew up in Anchorage, Alaska with some her fondest memories being of exploring the Chugach Mountains and hiking to pick blueberries as a fall tradition. She currently attends Willamette University as an Environmental Science and Anthropology double-major, and is particularly passionate about sustainable living. At Willamette, Rachel hosts the WU Unplugged Energy Competitions, where she works with students to help decrease their energy use and promote mindful consumption of energy and single-use plastics. She also coordinates student sports leagues and activities as part of the Intramural Program on campus. Rachel will graduate in 2019, after which she plans to either return to Alaska to spend quality time with her family, or remain in Oregon to pursue a graduate degree in a field related to sustainability, public health, or environmental health.